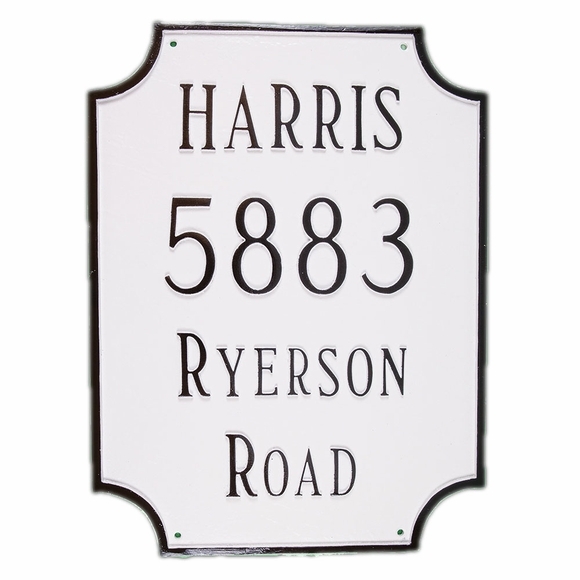 Personalized 4 Line Rectangle Address Sign - - 12"W x 15.75"H for wall mount or lawn mount. Made in USA. The rounded cut out corners add interesting visual appeal to the otherwise straightforward address plaque that puts your personalization in the spotlight. Line 1 is generally used for the family name. Holds up to 8 characters. Line 2 with the largest characters holds five 3" numbers. Lines 3 and 4 each hold 12 smaller characters. Vertical rectangle aluminum sign is designed for four lines of personalization. Comes in 26 different color combinations. Made in the USA.